Attending college is one of the most expensive investments an individual will ever make. Now that over 70 percent of graduating seniors can expect to enter the workforce with an average student loan debt of $29,400, choosing a college degree with the highest possible return on a student's investment is becoming more and more of a priority. 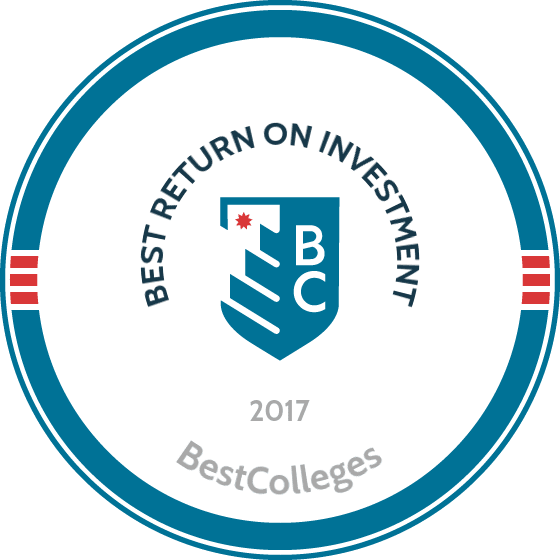 BestColleges is here to help students weigh the costs and benefits of their educational options. Using data collected by Payscale.com, we've put together a list of 50 public schools that offer in-state students the highest return on their tuition dollar. "Return on Investment" or ROI rankings for each school are primarily comprised from two factors -- the true cost of attending a school weighed against the median earning power of its graduates over 30 years. As the name implies, SUNY Maritime College specializes in programs related to marine engineering, shipping, oceanic transportation, and other maritime industries. Many graduates go on to pursue careers as ship captains, engineers, construction and building managers, and environmental safety technicians. SUNY Maritime College's ROI placed highest among all public universities, and beat out every Ivy League school, thanks to its relatively low tuition (roughly $90,000 for the complete degree) compared to the starting salaries of its graduates, which tend to be upward of $55,000 per year. Bachelor's degrees in mechanical, chemical, and general engineering are the most sought after credentials at the Colorado School of Mines. The school's focus is mining technology, with an emphasis on applied science and environmental resource protection. As a result, many graduates go on to pursue careers as geophysicists, resource protection officers, and, most prominently, engineers. An abundance of student aid is one of reasons why Colorado School of Mines' ROI is so high; roughly 3,700 enrolled students receive financial aid, and the average recipient will be awarded more than $7,000 during the course of their studies. According to Payscale, the seven career sectors that Georgia Institute of Technology graduates most often pursue are all concentrated in engineering: software, mechanical, electrical, aerospace, project, civil, and senior mechanical. Among these careers, the average annual salary is $73,137 ― roughly $14,000 less than the cost of a complete degree program. For this reason (as well as the average amount of financial aid received by students), it's easy to see why GIT graduates earn such a high ROI over the course of 30 years. Massachusetts Maritime Academy offers degrees in marine engineering, environmental protection, international business, and other fields closely linked with the maritime sector. The leading career path for graduates, marine engineer, earns a median annual salary that exceeds the cost of a degree at the school by nearly $10,000; the starting salaries of other popular career paths, such as operations engineer, field engineer, and environmental coordinator, hover between $40,000 and $60,000. The average student who graduates from South Dakota School of Mines & Technology will go on to pursue a career in a variety of lucrative fields like electrical, mining, and project engineering, where he or she will earn a starting salary of $62,400 ― which is roughly $23,400 less than the total cost of a four-year degree. The school offers more than 40 bachelor's, master's, and Ph.D. programs, most of which focus on engineering disciplines. Offering more than 120 degree programs that encompass 27 academic disciplines, NJIT is one of the most extensive institutes of technology in the country. The school's diverse degree selection, as well as numerous on-campus research opportunities, enable graduates to enter the workforce with plenty of skills and experience under their belts― and this readiness translates nicely into high salaries. The five leading careers for NJIT graduates -- electrical engineer, software engineer, senior software developer/programmer, mechanical engineer, and senior software engineer -- average a median annual salary of roughly $80,000. The school's expensive tuition (highest on our list of 50) keeps the already sizable 30-year ROI from being even higher. Missouri University of Science and Technology's engineering programs have earned lots of praise from academic experts, and student outcomes are one of the main reasons why. The seven leading career paths for graduates are concentrated in engineering, and all of them boast median annual salaries of at least $60,000 ― but none of them exceed $74,000, which would explain why a few other schools boast superior 30-year ROIs. The school is also distinguished for the percentage of students who receive financial aid (91%); nearly 7,000 enrolled students receive an average financial aid award of $7,394 over the course of four years. UC Berkeley boasts a higher 30-year ROI than any other public school that offers degrees in the liberal arts, as well as STEM disciplines -- most likely because the leading career paths for graduates are concentrated in high-paying fields like engineering, technology, and business administration. The three leading careers ― software engineer, senior software engineer, and mechanical engineer ― earn an average median salary of $96,878; however, the ROI for UC Berkeley grads is a little lower due to the $125,000 price-tag for a four-year degree (second highest among the top 10 schools on our list). CalPoly annually ranks among the finest tech institutes in the country, but in terms of ROI, the school is outmatched by smaller tech institutions that charge less in annual tuition and/or award more financial aid to students. Graduates most often go on to pursue careers in engineering, construction management, computer science, and other STEM fields ― as well as architecture, which (according to Payscale) is CalPoly's third most popular bachelor's degree program. UMass is relatively inexpensive (by New England standards) and three-quarters of the roughly 17,000-strong student body receives an average of $6,853 in financial aid during four years of enrollment. These two factors allow the school to outmatch most other public state universities in terms of ROI. The average outgoing graduate will earn a starting annual salary of $50,000 at their first place of employment; many alumni pursue careers in engineering fields, as well as accounting. Of the top U.S. schools for student enrollment, Texas A&M has the highest ROI (more than $100,000 greater than the University of Texas, Austin, which ranked at #27 on our list). The average graduate will earn a starting annual salary of $51,900. The most lucrative career path for alumni is petroleum engineering, which awards a median salary of $109,000 per year; other high-paying fields include mechanical engineering, construction management, and software engineering. UCSD charges lower tuition than most other schools in the University of California system (including Los Angeles, Davis, and Santa Barbara) and awards higher financial aid amounts to a greater percentage of the student body. All of these factors contribute to the stellar ROI of graduates who earn a degree from UCSD. The school's most popular career paths are concentrated in lucrative STEM fields like engineering, software development, and biotechnology. Of the 30,000+ students who attend Virginia Polytechnic Institute and State University (Virginia Tech for short), those who graduate with a degree will, on average, earn a starting salary of $51,700. However, the ROI is lower at VT because of low financial aid rewards; only 57% receive aid, and the average allotment for four years is $5,517 (roughly 6% of the cost of a degree). Higher-ranking schools on our list (with the exception of #1 and #4) boast a larger percentage of students that receive financial aid. The second-oldest university in the United States is also one of the most lucrative, according to Payscale, as well as the highest-ranking institution on our list that doesn't list STEM fields as the most popular career paths. Instead, graduates gravitate toward careers as management consultants, attorneys, business and marketing executives ― all of which earn starting salaries upward of $95,000 per year. Only 31% of the student body (roughly 2,600 individuals) receives financial aid, but the average award constitutes more than 15% of the cost of a four-year degree. The University of Illinois at Urbana consists of more than 150 degree programs offered through 17 different colleges, but according to Payscale, the most popular career paths for students are concentrated in high-paying fields like engineering and computer science. The school's emphasis on STEM studies and research essentially counteracts the high annual tuition and low percentage of students who receive financial aid, and allows the average graduate to enjoy a higher ROI than those who attend most other state universities. Many of Stony Brook University's graduates pursue careers in mechanical, electrical, and software engineering, but a substantial number of alumni also enter the fields of nursing and education (both secondary and postsecondary), as well. Typically, graduates earn $48,600 after graduation ― which is more than half the cost of four years' tuition at the university. Additionally, more than two-thirds of the student body will receive an average financial aid amount of $7,473 during the course of their degree program. Only one other school on our list tops New Mexico Institute of Mining and Technology's 92% of students who receive financial aid; the average financial amount for recipients is $6,647, which is roughly 9% of the cost of a degree at the institute. The seven leading career paths include hydrogeology and six different engineering disciplines; typically, graduates earn a starting salary of $50,500 once they've obtained a degree from New Mexico Tech. At 93%, no public school on our list awards more financial aid to its student body; the average recipient is given $10,236 over the course of four years. Coupled with the typical graduate's starting salary of $59,200, it's easy to see why Michigan Tech boasts such a high ROI for students that earn a degree there. All seven of the schools most popular career paths are in engineering fields; many students additionally earn their degree from Michigan Tech's prestigious School of Forest Resources and Environmental Science, which is considered by many academic experts to be among the finest institutions of its kind in the world. Montana Tech graduates, on average, earn an impressive starting salary of $63,100. This is because many of them earn specialized degrees that prepare them for careers in high-paying fields like hydrogeology, mine engineering, petroleum engineering, and industrial hygiene. And since four years' tuition of $78,130 (the sixth lowest in our list) is just $15,000 higher than the average starting salary, graduates stand to earn a considerable ROI over the course of 30 years. Engineering careers are common among SJSU alumni, as are graduates who obtain jobs as office managers, HR professionals, senior accountants, and software developers. Tuition is lower at San Jose State than just about any school in the University of California system, but so is the percentage of students receiving financial aid -- just 42% -- and the average award for recipients barely covers 9% of a four-year degree. The difference in ROI between students who receive aid those who do not is greater than $50,000. The average OIT graduate will earn $57,000 per year fresh out of college; engineering fields, as well as professional surveying, comprise the school's most popular career paths. However, students who earn degrees in these disciplines at other tech schools tend to earn higher salaries. For instance, mechanical engineers and project engineers who obtain their degrees at Michigan Tech outearn OIT graduates in the same fields by a rough margin of $3,000 and $2,000 per year, respectively. This explains why OIT's ROI is not as high as other schools of its ilk. The annual tuition of UCSB outmatches the typical starting salary for graduates by a margin of nearly three-to-one. However, according to Payscale, students who attend this school are likely to see their annual salaries more than double after just 10 years in the workforce. For this reason, the average UCSB grad will enjoy relatively high ROIs. It's also worth noting that the average financial aid recipient will be awarded an amount that represents more than 12% of the cost of four years' tuition. Purdue has earned acclaim for its engineering degree programs for more than a century -- and today, students who enroll there gravitate toward engineering science more than any other major. According to Payscale, the most popular career paths include mechanical, project, electrical, and software engineering; all of these fields award median annual salaries of at least $64,000. Since Purdue's tuition is a little higher than most technical institutions, the ROI for graduates is also slightly lower -- but still well above average. The University of Maryland is a popular school for students who pursue degrees in both business administration and STEM-related fields. The most widely selected career paths among the school's alumni include software and mechanical engineering, IT project management, and human resources. While all of these fields generally award median salaries upward of $64,000, the average starting salary for all graduates is closer to $50,000, and the median salary for grads who have been in the workforce for up to nine years is $71,267. The school's relatively low tuition (for a state university on the East Coast) is the main reason why the ROI for graduates is higher than usual. Engineering is the bread-and-butter of SPSU, which exclusively dedicates three of its five sub-colleges to engineering fields. Coupled with a four-year price-tag that falls below $80,000, it might come as a surprise that the school doesn't provide a higher ROI for its graduates. However, according to Payscale, engineering fields tend to be less lucrative for SPSU grads than for alumni from different schools with the same credentials. After nine years in the workforce, the average graduate is only earning $13,000 more than the typical starting salary. Longhorns typically earn a salary of $50,400 once they obtain their degree, but some of the school's leading career paths ― such as attorneys and petroleum engineers ― will be logging a six-figure after just a few years in the workforce. Barely half of the students who enroll at the University of Texas opt for financial aid, but the average recipient will see his or her ROI grow by $40,000 over the course of 30 years on the job. This extension of the larger University of Maryland in College Park emphasizes engineering, computer science, and other tech-based fields. Some of the most popular career paths for students include mechanical engineering, software and web development, business IT analysis, and graphic design -- which is a mixed bag in terms of median annual earnings. However, the two leading career paths -- software engineering and lead software engineering -- are quite lucrative for UMBC alumni. Software engineers earn a median salary that is $20,000 higher than the typical starting salary for graduates, while lead software engineers stand to earn nearly three times as much. UC Irvine boasts cheaper tuition than any of the three University of California branches that appear higher on our list (Berkeley, San Diego, and Santa Barbara), and graduates earn a starting salary ($48,900) that is comparable with these schools. So why isn't the 30 Year Net ROI for graduates higher? Degree selection is one of the primary reasons. While engineering fields lead the school in terms of graduate career paths, one of the most popular degree choices is the Bachelor of Arts― a credential linked to notoriously low-paying salaries. However, the average student who opts for financial aid at UCI will see their ROI increase by more than $70,000. East Coast colleges and universities ― particularly those located in New York ― are infamously expensive, but Baruch College charges lower tuition for a degree than any other college on our top 50 list. Business and finance are the two most popular majors for students, and graduates go on to pursue careers as financial controllers, HR generalists, executive assistants, and senior accountants. Although these jobs aren't as lucrative as careers within STEM fields, median salaries are high enough to earn Baruch College grads a decent ROI on their education. University of Virginia students typically pursue degrees in high-paying fields like engineering, finance, law, and business management -- and as a result, the typical starting salary for newly graduated alumni is $51,000. However, the average financial aid recipient will be given more than $15,000, roughly 17% of the cost of a four-year degree, and these individuals will see their ROI rise by more than $60,000 over the course of 30 years in the workforce. Colorado (particularly the Denver area) is a major technology hub, and many students who attend UCB earn degrees in engineering, computer science, aerospace, and other fields that will enable them to secure high-paying jobs within the state. However, more than 32,000 students attend the university every year, and a significant contingent choose to earn Bachelor of Arts degrees. For this reason, the typical starting salary for new graduates is $46,300; this figure is $3,000 higher at the University of Washington (another big contributor to the tech industry), while the cost of a four-year degree is $20,000 lower at UW. West Virginia Tech is the second-lowest-ranking tech school in the top 50 ROI list, primarily due to salary growth over time. Starting salaries for WVT graduates are comparable to other tech schools, but these individuals will earn roughly $6,000 less than their counterparts at CalPoly after 10-19 years on the job and close to $14,000 less after more than 20 years in the workforce. Furthermore, the majority of graduates find work in West Virginia, where the cost-of-living -- and annual earnings -- are much lower than in most other states. UAH's strong emphasis on STEM fields is evident by the list of the most popular career paths for graduates. However, alumni earn much less in these fields (including mechanical engineering and software development) than students who attend a higher-learning institution devoted to technical disciplines. Typically, the starting salary for the school's alumni is $49,600, but the ROI for graduates is relatively high because this figure stands to more than double for those who spend 20 years in the workforce. Five of the seven leading career paths for Michigan graduates -- mechanical engineering, software engineering, senior mechanical engineering, management consulting, and legal practice -- boast median salaries in excess of $75,000 per year. However, the school boasts a total enrollment of more than 43,000 students -- making it one of the largest universities in the country -- and the wide range of majors (as well as student outcomes related to these fields) drops the typical starting salary for graduates down to $51,000. Michigan's ROI is still higher than most public schools, but some degree-holders will enjoy a much larger ROI than others. UC Davis is one of the leading schools in the country for veterinary programs, and some of the other leading career paths for graduates include high-paying fields like engineering, law, and business administration. However, the high cost of tuition -- a common trend between schools in the university of California system -- prevents the ROI from being as high as it might be for students who attend cheaper institutions. A public research facility, the University of California (UCLA) is one of ten campuses within the state's educational system. Boasting 13 nobel laureates and 12 MacArther fellows, UCLA developed a reputation of academic excellence through its dedication to advanced research. These factors contribute to the ROI of students who earn a degree from the Los Angeles university. The school has a wide variety of STEM degree offerings which include chemical engineering, biotechnology, and computer science. Rutgers University produces its fair share of engineers, software developers, HR directors, and other professionals who earn relatively high annual salaries. But the school's leading career paths also include high school teacher, financial analyst, and other positions with median earnings that exceed the typical starting salary for graduates by less than $10,000. Clemson students, like those who attend many of the other schools on our list, gravitate toward engineering degrees. In addition to fields like mechanical, electrical, and software engineering with a popular nationwide following (and relatively high salaries), other engineering fields with lower earnings, such as civil and manufacturing engineering, are also represented in the school's leading career paths. For this reason (as well as higher-than-average tuition prices), the ROI is lower at Clemson than other, cheaper schools that emphasize technical disciplines. Students who earn a degree from SUNY at Binghamton ― the smallest and cheapest of the four schools in the SUNY system ― go on to pursue careers in a wide range of professional fields. Software, mechanical, and electrical engineers stand to earn median salaries in the range of $60,000 to $75,000. However, the typical starting salary for Binghamton grads is $47,200, largely due to the large number of alumni who work as administrative assistants, accountants, operations managers, and other positions that earn much lower salaries. Many George Mason graduates go on to pursue careers related to business technology. The school's leading career paths include financial analyst, staff accountant, software engineer, and IT consultant, all of which boast median salaries in the range of roughly $60,000 to $90,000. However, the student body numbers in excess of 33,000 individuals and the school is noted for its liberal arts programs (particularly creative writing) in fields with historically low salaries. As a result, the typical starting annual salary for new graduates is just shy of $50,000 per year. Tuition at the College of New Jersey is expensive compared to schools nationwide, but par for the course when it comes to East Coast learning institutions. The cost of attending TCNJ is slightly lower than that of nearby Rutgers, but the latter boasts a higher starting salary for new graduates by a margin of $1,300 per year. Furthermore, Rutgers alumni tend to earn higher median salaries; high school teachers who earn a degree there, for example, will out earn their TCNJ counterparts by more than $3,000. For this reason, TCNJ's ROI is lower than Rutgers'. UAF places great emphasis on science and technology programs that are applicable in the field of natural resource management. Graduates commonly pursue careers in high-paying fields like reservoir, petroleum, and civil engineering. Relatively cheap schools that produce a UAF's mid-career salary is $78,600 (ranked 114th for all state universities), which is only $33,000 higher than the typical starting salary for new graduates. One of the main reasons is location; many alumni choose to find work in Alaska, where wages tend to be a little lower compared to the lower 48 states. Tuition at the University of Delaware is on the low side for an East Coast school and new graduates (many of whom pursue careers in engineering fields) will typically earn a starting salary of $50,300. However, students who choose to study at the University of Maryland tend to earn more in the same fields. Mechanical engineers who graduate from the University of Maryland, for instance, will outearn their UDel counterparts by more than $3,000 per year. New UConn graduates will typically earn a starting salary of $49,700, which is roughly half the price of a four-year degree. However, the leading career paths for alumni -- which are concentrated in engineering, business, and information technology fields -- range in median annual salary from $57,000 to more than $80,000. The ROI at University of Connecticut is relatively high (especially for students who receive financial aid), but UMass Lowell -- where the tuition is cheaper, starting salaries are higher, and alumni tend to earn more in median earnings -- still offers the best deal of any state university in New England. NC State specializes in STEM-related studies, so it's no surprise that the seven leading career paths for alumni are heavily grounded in computer science and engineering. The typical graduate earns a starting salary of $48,500. However, the school is one of the few state universities on our list to place higher in terms of mid-career earnings (#45) than ROI (#47). According to Payscale, the average alumni who has been in the workforce for 10 to 19 years will earn a salary of $84,700 -- more than $6,000 higher than the cost of a four-year degree from NC State. At 88%, the University of Minnesota: Twin Cities awards financial aid to more of its student body than any other state institution on our list. However, the average aid recipient will only be given about 6% of the total cost of a four-year degree, a difference in ROI of less than $25,000. The seven leading career paths for graduates are all in engineering fields, with median salaries that range from $56,000 to nearly $100,000 per year, but a large amount of students who earn degrees in low-paying disciplines like communications effectively bring the typical starting salary down to $48,700. Louisiana Tech places lower than any other technical institution on our list, and the primary reason is career earnings for graduates (most of whom pursue careers in engineering fields). Compared to West Virginia Tech (the next lowest tech school, at #33), the starting salary for Louisiana Tech grads is nearly $3,000 lower; this figure compounds over time, as West Virginia Tech alumni who have been in the workforce for five to nine years outearn their Louisiana Tech counterparts by nearly $10,000. The cost of a four-year degree at UT Dallas is nearly $5,000 lower than the University of Texas at Austin, but students who graduate from the latter school tend to earn much higher salaries. The median salary of software engineers who earn their degree in Austin, for example, is more than $10,000 higher than their Dallas counterparts. For this reason, a degree from the larger branch of the University of Texas earns graduates a better ROI than credentials obtained at the Dallas branch. Our top 50 ROI list concludes with the last-ranked California State University, Cal State, Chico -- although it's worth noting that this school's ROI still surpasses that of nearly 400 other U.S. public universities (according to Payscale's data). Cal State, Chico's tuition is cheaper than any of the schools found in the University of California system -- but while the typical salary for new graduates is on par with those other institutions, the mid-career median salaries are considerably lower. Some of the highest ranking schools may surprise you. That's because more prestigious schools are often more expensive (possibly disproportionately expensive) and cannot offer the same return on each tuition dollar that a lower-cost school, like a technical college, might. For instance, according to the data, SUNY's Maritime College in the Bronx offers its students the highest ROI of any public school in the country. The survey found that the 30 year median salary of SUNY Maritime graduates is very close to the median salary for MIT grad — $1,586,000 compared to $1,606,000, respectively. But depending on your financial aid situation or your post-college plans, SUNY Maritime might offer you a better ROI. This year, the projected total cost of a bachelor's degree from SUNY is only $90,530. Students enrolling at MIT this year can expect to pay the hefty sticker price of $215,000 for their four year degree. It's important to keep in mind that this list measures the ROI of a bachelor's degree in terms of dollars and cents only. If you are not interested in choosing a career within the narrower professional scope for which a degree from SUNY Maritime or the Colorado School of Mines would prepare you, you shouldn't choose your school based upon tuition and salary rates alone. If you're interested in pursuing a graduate degree, this survey will be less useful for you. This Payscale dataset only includes information on bachelor's degree programs. Survey results from employees that hold Master's degrees, an MBA, MD, JD, PhD or any other advanced degree were not included in this data. 30 Year Net ROI: This figure represents the amount of money earned by an individual over the course of 30 years minus the total cost of tuition at the time he or she graduated. Percent of Students Receiving Financial Aid: This figure indicates the percentage of students enrolled at a particular school that receive loans, grants, scholarships, and other monetary rewards used to finance tuition, room and board, and other academic expenses. Average Aid Amount: This number is calculated by tallying up the total amount of financial aid received by all students at a given school, and then dividing it by the number of students receiving aid. 30 Years ROI with Aid: This figure is calculated the same way as the 30 Year Net ROI, except that the student's net (not total) college costs are subtracted from his or her career earnings.